Free A.S.N images for F.B. No, I wasn't thinking about a Pete Seeger song. It is just how I was feeling after my last visit here. Now don't get me wrong. I still Believe in everything that I am doing. I was just not getting the results that I need. Then, to top it off, I engaged in a strong push to make it to Featured Member of the Day only to make it the day after I quit pushing. Nothing seemed to be going right. Like the quote from A.A. Milne, “Sometimes I sits and thinks, and sometimes I just sits...” I have found that after you have been banging your head against the wall for a while, that it is a good Idea to take a break, look around, and see what you might have been missing. Simply stated, not enough of the people that have signed up under me with All Solutions Network are actually using it. It is hard for me to understand in one direction and perfectly understandable in the other. There is so much available through my ASN Links that it can be overwhelming. The trick is to find what you need and make it work for you. When I first started exploring the Internet for ways to make a living online, I decided to set up my own website. I understand that that is not for everyone. Especially as I chose to do it the hard way. I have created every line of code in my site. For reasons of the time, I started out with GoDaddy. There I could host one domain for the low price of about $135 per year. With ASN Hosting, I now pay $12.95 per month and I can host up to 10 Domains. Some of you have noticed the higher initial cost. That is offset by the fact that my ASN Hosting at 6 points monthly pays me back about $5 per month paid every time I reach the $20 minimum payment threshold. (Net Cost about $95 per Year.) That is with only a couple of active members below me. With enough of my downline doing the same thing, I could actually be making money from this small investment. So I have been and continue to think about where the problems might be with my ASN Users. For all the value and possibilities in the many All Solution Network pages that you have to share, there are a few problems. It is easy to say, “Share this and make Money.” It is another thing to actually do so. Parts of my Nove-Noga Website are devoted to making All Solutions Network easier to use and share. One of the first problems my ASN Users made me aware of was the difficulty in finding specific pages again. Your free All Solutions Network site contains well over 100 pages dedicated with your ASN User code. The ASN Sitemap at NoveNoga.com is designed to display Your ASN Sitemap. Simply Click the Button on the page [Click to Enter ASN User Code] and replace my code with yours. Voila! Now you are looking at your very own ASN Sitemap. If you are not a member yet, you are welcome to Click the Button to reveal my own ASN Sitemap. Over my “Hiatus” I have added many of the newer All Solutions Network Pages. *Note: NoveNoga.com is not a typo. As my first choice for a Domain Name, it was held by Noveno, GA. When it became available, I snapped it up and I am now using it to support information to help all ASN Users. To make it easier to Create your ASN Posts on your Facebook Fan Pages, I created the Facebook Images Page for ASN Users at NoveNoga.com. There you will find Facebook Safe images that you download to your own computer and use in your own Posts. Like the ASN Sitemap, simply click the button to display your own ASN Page references. The instructions for making these images part of your own posts is included on the page. With some minor exceptions, images safe for use on Facebook should be .jpg, .jpeg or .png images. The minimum size is 200x200. Best results are found with square image from 200x200 to 1200x1200 and the Wide Business image size of 1200x627. Besides making our new place more livable and reading lots of books, (confirmed readaholic) I also did some maintenance on my website(s). 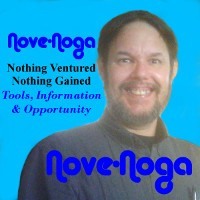 Nove-Noga.com now stretches across three domains. The Bluefish Editor readily available through my Ubuntu Software Center has changed the way I work on my web pages. Many of the new ASN Pages have been added to the ASN Sitemap and related pages and I have added some of the new images to the Facebook Images page on NoveNoga.com. With so much of ASN to Share, I am thinking that a new post daily is the way to go. If it works for me, maybe it will work for you.